Due to the rise of digital gadgetry, writing is starting to overtake talking as a way of communicating informally with our family and friends. This upsurge in informal written correspondence is causing our writing habits to change rapidly. You are expected to respond quickly to messages. You are often subjected to a harsh word restriction. You cannot afford to spend too much time fiddling with a 3-inch "keyboard" while trying to do something else. As a result, there has been an unprecedented influx of new abbreviations, icons, and specialist cyber terms into our language. These new additions are not immature ramblings. 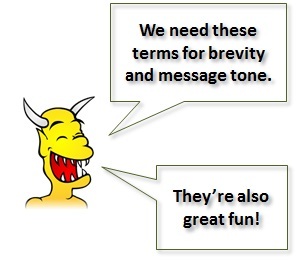 They have come about through necessity (brevity and message tone) as well as a sense of fun. To record the new terms emerging in the digital arena. To provide an online "dictionary" for those who want to look up a term. To provide an online resource for those who want to learn the terms. To provide a central repository for all these new, and now-not-so-new, cyber definitions. 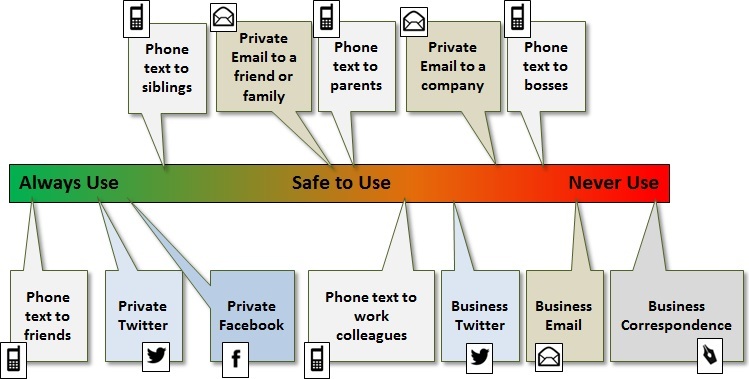 As time goes on, we expect many of the types of correspondence in the "Never Use" category to start moving left towards "Safe to Use". And, when they do, more people will need to know these cyber terms. But, don't worry. We'll be here to help!